Bus lines 27 and 48 will be diverted during the Sibelga works in the rue Haute/Hoogstraat from Monday to Friday. As from 22/2, bus line N12 is not longer diverted. Bus 27 and 48 are note longer diverted on Saturday and Sunday. The buses towards Andromède/Andromeda are diverted between the stops Gare du Midi/Zuidstation and Chapelle/Kapellekerk via the boulevard Maurice Lemonnier/Maurice Lemonnierlaan and the rue des Bogards/Bogaardenstraat. The stops Fontainas, Porte de Hal/Hallepoort, Hôpital Saint-Pierre/Sint-Pieters-ziekenhuis and Jeu de Balle/Vossenplein are not operated. A temporary stop is operated at the boulevard du Midi/Zuidlaan no. 62 (at the station Lemonnier). The stops Anneessens and César de Paepe of bus line 86 are also operated. 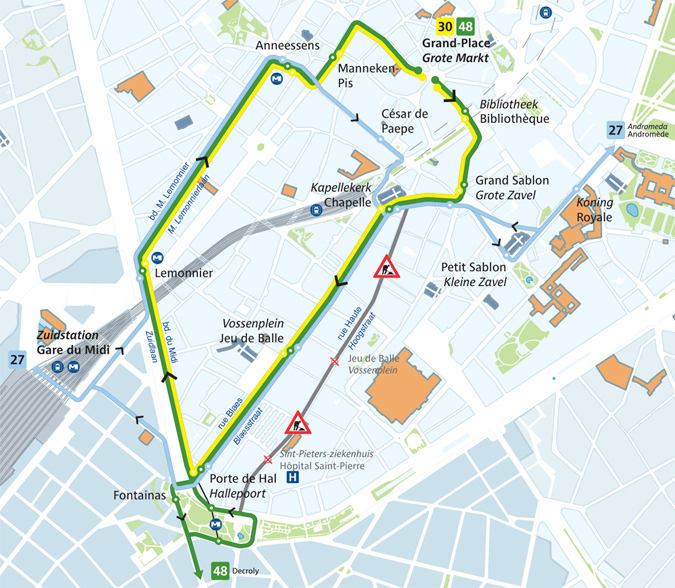 The buses towards Grand-Place/Grote Markt are diverted between the stops Porte de Hal/Hallepoort and Grand-Place/Grote Markt via the boulevard du Midi/Zuidlaan, the boulevard Maurice Lemonnier/Maurice Lemonnierlaan and the rue du Midi/Zuidstraat. The stops Hôpital Saint-Pierre/Sint-Pieters-ziekenhuis, Jeu de Balle/Vossenplein, Chapelle/Kapellekerk, Grand Sablon/Grote Zavel and Bourse/Beurs are not operated. A temporary stop is operated at the boulevard du Midi/Zuidlaan no. 62 (at the station Lemonnier). The stops Anneessens and Manneken-Pis of bus line 33 are also operated. A shuttle bus with line number 30 operates between the rue Blaes/Blaesstraat and the stop Grand-Place/Grote Markt to maintain a connection between the Marolles district and the city centre. Line 30 is operated from 6.30AM to 9PM from Monday to Friday. Use the itinerary search to plan your adapted journey.